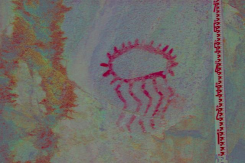 This entry was posted in anthropology, Archaeology, First Nations, Northwest Interior and tagged pictographs, rock art, Stein River. Bookmark the permalink. I really need to check your blog more often, because this would have been a fascinating talk to take in. When I in Gr. 10, many years ago, my geography teacher took our class on a two-day hike up the Stein Valley, and as we crossed under the massive cliffs he pointed out some of the amazing rock art. I don’t remember any of the specific pieces, but he said much of it could be interpreted as depicting an ancient trade route between the BC coast and prairies. Other pieces showed supernatural creatures, possibly deities, shamans or spirit animals.